The Skinny: Hackneyed sports movie buoyed by engaging stars and no real pretension. by Kozo: Marginally uplifting story of a women’s volleyball team that overcomes the odds thanks to their pluck, determination, and photogenic ability. Derek Yee is the coach, a clumsy science teacher who’s conned into coaching when team captain Carman Lee takes a shine to him. For the rest of the team, the filmmakers basically took a who’s who of cute HK bit players and threw them onto the squad. The team includes such luminaries as Farini Cheung, Josie Ho, and Annabelle Lau. 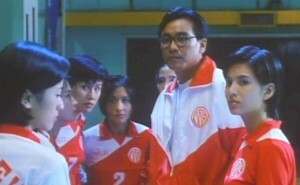 Hilary Tsui is a standout thanks to her role as the team’s Michael Jordan, whose vicious hops make her the secret weapon in the team’s final battle. The rival to our team of young cuties are the Devil Women, a rather Amazonian bunch of spikers whose impregnable defense leaves the team with nothing to do but get stuffed every rally. However, Derek Yee develops the “Changing Partners” stance, which isn’t a move for swingers, but an incredibly effective fake-and-slam move that’s designed especially to humble the Devil Women. Surprise: it works.